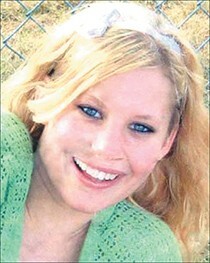 Karee Bazzano was good friends with Angel Wilson before Wilson went missing in 2007. When Angel Wilson walked down the hallways of Ferris High School, the crowd would part to let her and her best friend Karee Bazzano through. They were pretty rebels, tough girls who would smoke cigarettes at lunchtime and didn’t think twice about ditching class. Bazzano met Wilson in the seventh grade, and said from the time they met they “were 24/7.” They’d sleep over at each other’s houses for entire weekends and carpool to school everyday. On nights they were apart, they’d sneak out their bedroom windows in the middle of the night and meet to smoke cigarettes. In Wilson she found her first real friend. Wilson lived exclusively with her father, Oliver Rice, since she was just a toddler. Her mother was a drug addict, and Rice wanted to raise his daughter in a safe environment. She was a cute kid, and the older she got, the more striking her features became. She was a wisp with blue eyes and blonde hair and a pair of crooked front teeth, but with a big personality and a never-back-down attitude. She carried herself with the confidence of a grown woman. She was small but scrappy — and nothing scared her. By middle school, Oliver Rice saw his daughter changing from a loving little girl to a smart kid with a lot of attitude. She knew how to push his buttons — and she did at every opportunity. Marilyn Walker, a longtime family friend who loved to take Wilson shopping for new school clothes every year, remembers walking through NorthTown Mall with the girl and watching people turn their heads to get a look at her. By 14, Bazzano and Wilson hatched schemes to run away from home. They’d disappear for a day at first, crashing with boys they knew to smoke pot. Sometimes they’d end up in dirty downtown apartments of people they didn’t really know, where pregnant teenage girls sidled up to ex-cons who’d recently found freedom. Whenever the police would show up, they’d shake their heads and tell the two girls to go home. Their parents were worried. But with each escape, the girls became more ambitious, and they looked for any reason to run away. Instead of just leaving, they’d try to disappear, dying their hair black and sweet-talking friends and acquaintances into a few spare bucks or a place to crash. By 14, they disappeared for nearly a week after convincing Wilson’s old boyfriend to drive them to Sandpoint to stay with her mother. They were found by police hiding in cardboard boxes in a bedroom of her mother’s house. Bazzano and Wilson discovered they’d run out of wrist-slaps. They were booked into a juvenile detention center, and classified as codefendants. They could never be in the same room together — couldn’t even take showers at the same time. But even then they weren’t afraid to break the rules. Wilson wore her trips to juvie like badges of honor. But Bazzano started to get scared when she found out her friend was getting involved with a 30-something meth dealer who lived in the seedy neighborhood near Altamont and Third Avenue. Wilson only brought Bazzano to his house once. It was filthy inside, there were dirty kids and people were smoking meth. Wilson told her best friend that the drug dealer was beating her up. She was scared of him. Bazzano didn’t like where things were going. She caught Wilson in lies, and couldn’t understand why she’d stay with a guy who hit her. And she didn’t like the scary places where she hung out, especially the weird trailer park where an old man wanted the two girls to smoke meth in exchange for bags of marijuana. Meth was what divided them: Bazzano didn’t want to do it, and Wilson couldn’t get enough. As Bazzano saw it, Wilson had lost sight that she actually had things pretty good. Sure, her father was strict, but he loved her. But she had a family and friends who cared about her — people who would drop everything for her, who’d buy her clothes and take her out to lunch for her birthday no matter how many lies she’d told them. Angel Wilson felt so tough inside, so damaged, so angry — though no one really knew why. The people around her knew that inside, she was just a scared little girl running from some invisible demon. After Angel Wilson dropped out of Ferris after 10th grade, she bounced from couch to couch. Marilyn Walker, the family friend, allowed the girl to move into her condominium for a time and entered her into Daybreak, a drug treatment program. She seemed to be doing well. One afternoon, Daybreak offered a roller-skating trip for the kids at Roller Valley. There Wilson chatted up a group of boys — including a dark-haired country kid named Will Wilson. She told him she was 19. He was a 21-year-old machinist who worked 60-hour weeks and was new to Spokane. The two texted back and forth constantly and started hanging out all the time. Will loved her free spirit, and he treated her like a princess. He got her a dog, and let her drive his new car where ever she wanted. Will was in love. Within four months, he asked her to marry him. And it wasn’t until she brought him to meet her father that Will found out that his beloved Angel was actually 17. Wilson’s father, Oliver Rice, loved his daughter, but he was sick of her antics: the drugs, the running away. He thought if he gave the kids permission to get married, his daughter might finally clean up her act. The pair were wed at the Hitching Post Lakeside Chapel in Coeur d’Alene — a wood-sided building with two tiny rooms for weddings: one adorned with roses and leafy garlands, the other with walls decorated with cowboy boots and rifles. Angel wore a white dress, and Rice and his mother watched as the young girl said her vows. Wilson didn’t work and had no interest in getting her GED. But Will says he was clueless that she was doing drugs behind his back and spending time with her ex-boyfriend, the meth dealer. On Aug. 10, 2007, Will was exhausted after a long day at work. As he nodded off on the couch in front of the television, Angel flicked a lighter next to him. They would sometimes smoke marijuana, but this was something else. She was smoking meth. Will had seen his wife throw temper tantrums when she didn’t get her way before, but he couldn’t imagine that she’d never come home again. And now he fears that she might show up one day — and who knows who she’d have with her? Today, her best friend, Bazzano, is 23 and is the mother of her own child. She wishes she knew what happened to her old friend. Tom Henderson knew he had to get her a message. The Spokane County Sheriff’s detective wanted Angel Wilson to know he wouldn’t send her home again. He’d told the street kids outside Crosswalk, a downtown Spokane teen shelter, to tell Wilson that he just wanted to make sure she was safe. Though Henderson had been a detective for decades at that point, he quickly found out that the 17-year-old Wilson was a master at disappearing. He suspected that she would stay hidden until her 18th birthday, when she would no longer be a child runaway, but just another adult who didn’t have to answer to anyone. Sheriff’s Detective Lyle Johnston, who has also searched for Wilson, says missing persons cases often concern people with histories of risky behavior. Angel Wilson fell on the line: She was young, but she often teetered on the edge, and relied on questionable people to get by. But does a person’s history affect how hard cops look for them? “I would say typically we probably put as much effort as we put looking into the bad people as the good person,” Johnston says. Six years later, Oliver Rice thinks investigators looked at his daughter as a no-good runaway. And that, despite being underage at the time, he says they treated her case like she was a bad person that shouldn’t be found. “As far as they were concerned, she wasn’t worth anything because she had trouble in her past,” he says. Henderson says he treated Wilson’s case extremely seriously, but tips were scarce. If people had see her, no one made a peep. To report information or tips on Angel Wilson’s disappearance, call Crime Check at 456-2233.